Disclaimer: Keep in mind, as you scan my scathing review, that I use Megabus nearly every other week. It isn’t all bad. Taking a Megabus between Boston and NY is always an adventure. It can be an entertaining experience, if you have a dark sense of humor and an abundance of time on your hands. There have been a handful of times in which I’ve arrived to my destination on time, but that’s out of probably one hundred total trips. The reality is that one can pay as little as $1 for a Megabus ride and rarely more than $50 (I’ve seen higher, but it’s unusual), whereas a train ticket costs over $80. Furthermore, the train doesn’t get me any closer than the bus to my home outside of Boston, or my apartment in Brooklyn. My time is essentially split between the two places, making it impossible to justify paying an average of ten times more to take the train. Therefore, I take the bus. I’m always on the bus. I’ve determined that this year alone, I’ve spent over 200 hours on the bus between Boston and NYC, and even more travel time on the subway and in the car to and from bus stops. If I’d taken a train instead of a bus all the times I’ve traveled back and forth, I’d have spent somewhere near $3000 on transportation between Boston and NY. Cost may be the most (or only) compelling reason to use the bus. I take Megabus instead of BoltBus, though prices are comparable, because Megabuses are double-decker, which creates the illusion that they are more fun and spacious. I’ve stuck with Megabus out of loyalty and familiarity, I suppose. Megabus is not especially fabulous. Never rely on the availability of outlets and WiFi when setting off on your Megabus adventure. Internet and outlets are advertised, but flaky, at best. You can show up to try for a ticket on a bus before or after the one you’ve reserved, but don’t expect that there’ll be space. I’ve shown up to the NYC Megabus stop on 34th Street between 11th and 12th up to three hours early in hopes of hopping on an earlier bus, and ended up waiting three hours to eventually board the bus I’d initially booked. In short, as with anything else, standby doesn’t always pan out. Silver lining: sometimes standby does work in your favor, and the charge is only $5 to change your ticket time. There are no snacks distributed. BYOS. If you buy your tickets well in advance, your are more likely to find a $1 ticket than if you wait. I think the way it works is that the first ticket sold on every bus costs $1, and then the next few cost $5, and then ticket prices get increasingly expensive as the bus fills. Megabus drivers aren’t able to work beyond the hours determined in their contracts, and occasionally must end their shifts part-way through trips. When this occurs, confusion ensues, and sometimes you have to wait at a random bus stop for a new driver to take over. I was happy to finally figure this out. It is up to the driver to determine if a rest stop-break is appropriate. Some buses stop for 20 minutes, while some don’t stop at all. It always seems to me that the buses that stop are the ones already running an hour behind… You’ve been warned. 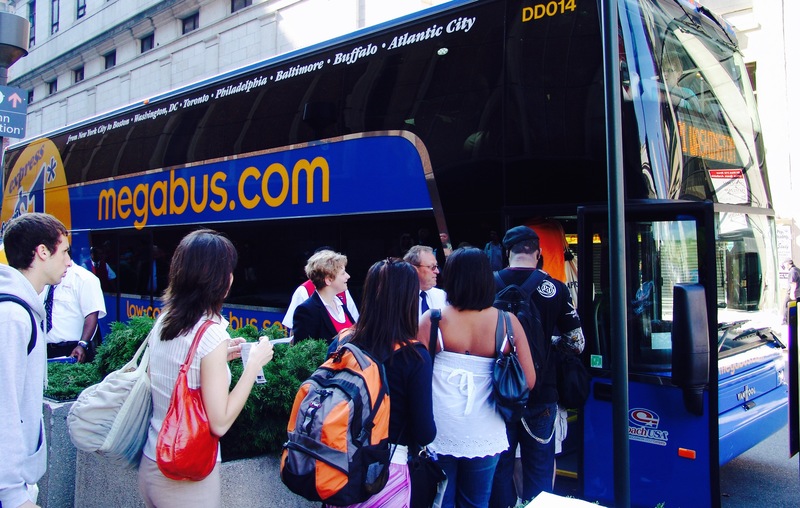 Taking a Megabus home for the holidays is an affordable nightmare. The NYC departure location in particular is pandemonium the day before Thanksgiving. Going from Boston to NYC is slightly less chaotic, as South Station is better organized than the out-of-the-way NYC Megabus stop, but traffic can be terrible in both directions. Unless you are traveling between 10am and 3pm, or late into the night, never expect to arrive on time. Opportunities for traffic are plentiful between Boston and NY. …bringing candy on your trip as an indulgent distraction from an unpleasant experience. …remembering a phone charger (particularly if you have a smartphone) so that, in case the outlets work, you can frequently check your proximity to your destination and notify anyone waiting for you that you’ll be arriving two hours later than anticipated. …remembering that you probably only spent $5 on your bus ticket. In this instance, beggars can’t be choosers. I have taken mega bus when I lived in the UK. It was such a long winded journey. I always felt very tired and cranky by the time I reached my destination. This past fall I took a MegaBus from Chicago to Dallas – yes, that’s right, across the country – and I completely feel you. I’d taken the bus on various different trips before, but this one was definitely too much even if it only cost $5 and I dreaded the ride back up north. I would still use MegaBus, just not for a trip that far away again! Great, relatable read! Haha! I first used Megbus about 7 years ago. I live in the UK and when I first saw this advertised it seemed like an awesome way to travel around the country for cheap. My experience was pretty much as you described.. but worse. If you think its not too great in the U.S don’t ever use it here. I travelled from San Fran to L.A on Megabus about 4 months ago.. it was alright.. and for the price I couldn’t complain. Hear what your’e saying about rest stops though. Well Megabus is a joke in itself 😉 Thanks for reading. I love this… especially numbers 3, 6 and 7. I take it to London quite often in the UK. The hygiene standards and noise levels are unbearable, especially when hungover. Never take Megabus on a hangover. You’re right, that’s the only thing that can make the experience worse than it already is. Please keep up with this really cool blog, I love the concept! As a fellow travel enthusiast I really look forward to your posts on travel tips and all new interesting places you’ll set your foot in. Have fun while you’re at it! Thank you, I really appreciate your feedback! Happy travels!